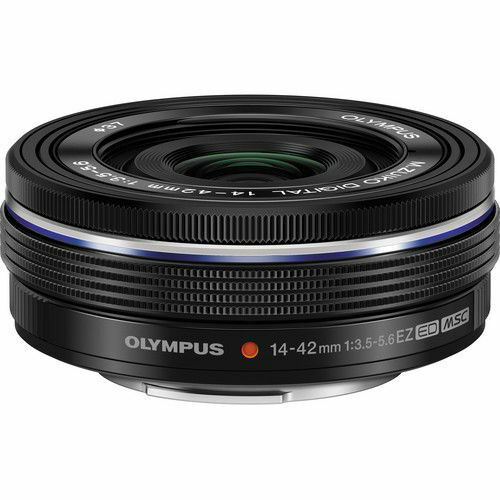 Distinguished by its slim pancake form factor, the black M.Zuiko Digital ED 14-42mm f/3.5-5.6 EZ from Olympus is a versatile 28-84mm equivalent zoom designed for Micro Four Thirds mirrorless cameras. Despite its compact profile, this lens includes an advanced optical design, which includes aspherical, low dispersion, and high refractive index elements to achieve a high degree of sharpness and clarity throughout the zoom range. A ZERO coating has also been applied to individual elements to suppress flare and ghosting for high contrast, color-accurate imagery. In addition to the optical design and small size, the lens is also characterized by its Electronic Zoom mechanism, for smooth and constant zoom movements, and a Movie & Still Compatible (MSC) AF system that is quick, quiet, and precise to suit both video and photo applications.